APRIL Group rejects claims made in a letter published by Mongabay on 22 April discussing our activities on the Island of Pulau Padang, Sumatra, Indonesia, as well as the sweeping false claims included in the article. These claims have been responded to repeatedly. We encourage readers to review the facts again at APRILDialog.com. At a wider level, we also encourage readers to review the recent Stakeholder Advisory Committee (SAC) reports and recommendations, as well as an Action Plan published in March 2015. The Action Plan sets out what we are doing to meet our sustainability commitments. These documents can also be viewed at APRILDialog.com. The facts are these: APRIL Group’s concession area at Pulau Padang totals 33,754 hectares. The concession was awarded under license by the Indonesian government. Within the Company’s concession and following the completion and peer review of five High Conservation Value assessments (HCV) by independent consultants, 9,602 hectares were set aside for conservation, with a further 5,694 hectares set aside for community purposes. We have also implemented a number of community development programmes that benefit villagers. These commitments are significantly more than legally required. Importantly, the final land usage described above resulted from a mediation process involving local villages. This preceded the concession license and was carried out by an independent group of eminent experts comprising central, provincial and local government officials, academics and NGO representatives. The mediation team applied Free Prior Informed Consent (FPIC) principles, with 12 of 14 villages opting to be included in APRIL Group’s concession. As a result of this process, APRIL Group gave up 17 percent of the original concession area in line with a revised decree issued by the Minister of Forestry. Most of the area given back is now being encroached, burned, and degraded. APRIL Group is committed to balancing sustainable plantation alongside conservation land. 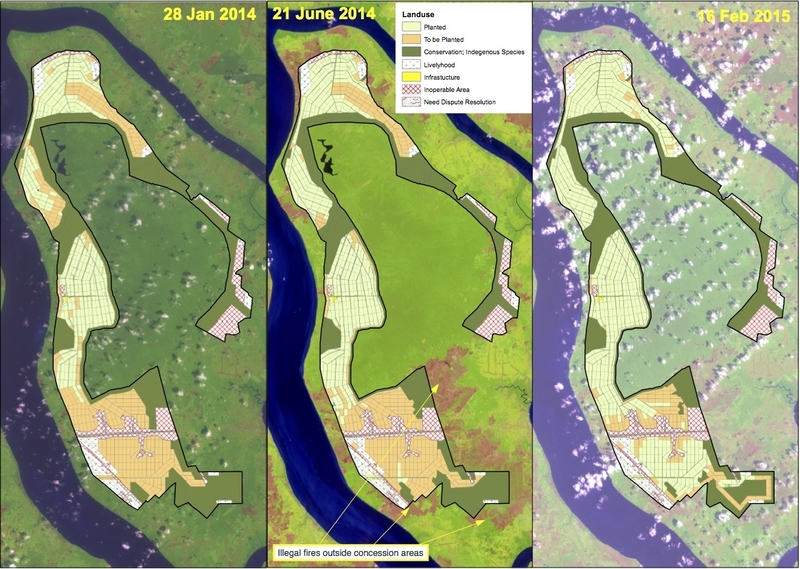 These satellite images illustrate our progress on the ground at Pulau Padang, where APRIL Group’s concession area largely surrounds the peat dome – a valuable conservation area. 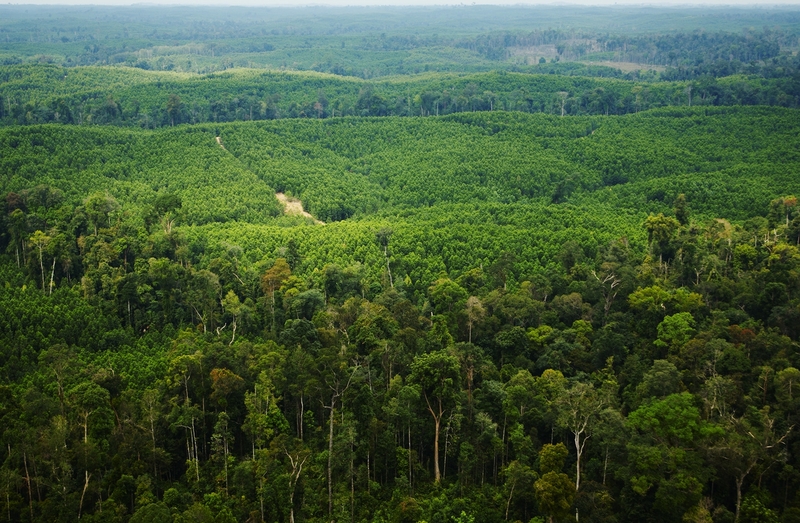 The satellite maps show how the establishment of a surrounding buffer plantation zone supports its protection and conservation. They also show the impact of illegal fires outside the concession area, and their threat to conservation and plantation on areas that are left unmanaged.